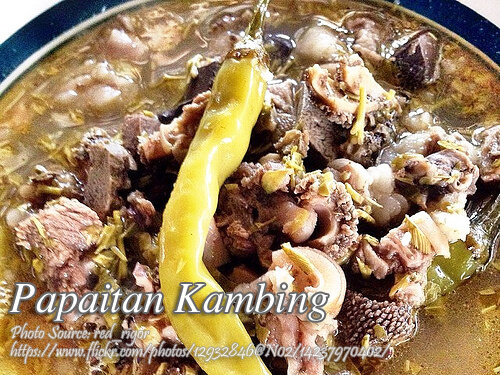 Papaitan kambing (or bitter goat stew or goat innard stew) is a popular Ilocano dish composed of goat’s innards such ad tripe, lungs, intestines, kidneys and of course the bile. The bile is used to make the stew bitter but the authentic Ilocano papaitan uses the green enzymes from the small intestines. But if don’t like to use the enzyme you can use the bile instead. Or there are other alternative to make the stew bitter. You can boil some bitter melon leaves which taste like the green enzyme. If you ask me I’ll go for the bitter melon leaves because I’m not fond of eating stuffs inside the intestines. Papaitan kambing (or bitter goat stew or goat innard stew) is a popular Ilocano dish composed of goat's innards such ad tripe, lungs, intestines, kidneys and of course the bile. Wash the goat's tripe, lungs, small intestines and kidneys thoroughly and set aside the intestines. In a medium size pot put the tripe, lungs, kidneys, whole garlic and crushed ginger with enough water just to cover the meat. Boil for at least 15 minutes then drain. Let is cool and set aside. In another pot, put the small intestines and fill with water just enough to cover the intestines. Boil for at least 15 minutes then drain the intestines and set aside to cool. Save the green liquid from the boiled intestines which you will use later as papait. Slice all the goat innards into tidbits. In a small pan saute garlic until fragrant then follow the onions and ginger and saute until the onions are soft. Add the goat innards and saute for about 9 minutes or until the innards starts to produce oil. Pour some fish sauce or patis and stir for 4 minutes then pour water just enough to cover the innards. Simmer for at least 1 hour or less or until the meat is tender. Add water if the liquid is evaporating too much. Last but not the least add the siling haba, sinigang mix and the papait (the green enzyme). Add the sinigang mix and the papait a little at a time until the desired bitterness and sourness is achieved. Simmer for another 4 to 5 minutes and season with salt, pepper and granulated seasoning. Serve hot with steamed rice. Thanks for this papaitan recipe. You are very creative using an alternative “papait”. I didn’t know that you can use ampalaya leaves as an alternative. I will definitely try this recipe! Hi Carolina, yes ampalaya leaves can be used as an alternative because it is very bitter. Healthier too than intestinal organs! Hi Nicole, I think adding a little more water and a small amount of sugar will help.